Expansion plans at London City Airport have been announced and the government is expected to decide on where to build a new runway, probably at either Heathrow or Gatwick this October. These plans are devastating for local pollution, noise and for climate change. In solidarity with local and international groups, and in defence of the climate and people all over the world, Reclaim the Power is calling for people to take safe and peaceful action against the aviation industry. Join us for a family-friendly flashmob and critical mass bike block at a London airport on Saturday 1st October. The exact location is being kept secret, to keep the authorities on their toes – sign up now to receive more information. Our mass action is just one part of a wave of international action planned to take place around the same time of year. In order for this action to be effective, *we need at least 400 people to take part*. We need to send a strong clear message that we cannot have any new runways in the UK if we are serious about tackling climate change. >> WILL YOU JOIN US IF HUNDREDS OF OTHERS PLEDGE TO COME? 1) Add your email address to the pledge platform here: http://tinyurl.com/jxsxkyf, so that we know when we reach our target of 400, and so that we can let you know more info as it’s revealed. The more people who sign up, the more others will want to join, and the more effective we can be. 4) Join this Facebook event, and share it with all your friend. This will be a fun, colourful and safe event that everyone is invited to participate in. An action consensus has been agreed to set the safe parameters of this day of action. The health and safety of airport staff, passengers and ourselves are of paramount importance and a top priority, and just in case it is not clear we will not be going on to any runways! Visually and creatively we will focus on the polluting aviation industry, the affluent minority who are driving the so-called ‘need’ for aviation expansion, and the 300,000+ people who are already suffering from the effects climate change, and who are paying the price for this convenient luxury lifestyle, with their lives. There will be three main ways that people can participate in the day of action, individually and as part of affinity groups that will have autonomy over how they operate. * Reimagining the alternatives – what could a future without aviation look like? (3) Autonomous affinity groups are also invited to take creative action elsewhere, as part of the day of action, adhering to the same action consensus. After years of delay, the controversial announcement of a new runway at Gatwick or Heathrow is expected this October. It comes just months after the green light was given to expansion at London City Airport, and makes a mockery of our own legally binding commitments for action on climate change. Clearly, more planes means more catastrophic climate change. It is time to fight back. Air travel is by far the most carbon-intensive form of transport, and is the fastest growing source of carbon emissions. Yet, climate change is still remarkably absent from any discussion around aviation expansion. Moreover, aviation is unbelievably absent from any discussions, agreements and targets around tackling climate change! It was excluded from the Paris Agreement signed by the World's nations at the UN COP21 last December, and is even exempt from the UK's own Climate Change Act 2008. It is an industry that benefits from huge tax subsidies and unprecedented legal and regulatory loopholes, and is threatening the lives of communities both locally and globally, as well as the very planet we all live upon. The Climate Crisis is a racist crisis! Plane Stupid supports the Black Lives Matter UK invention at City Airport earlier this week. 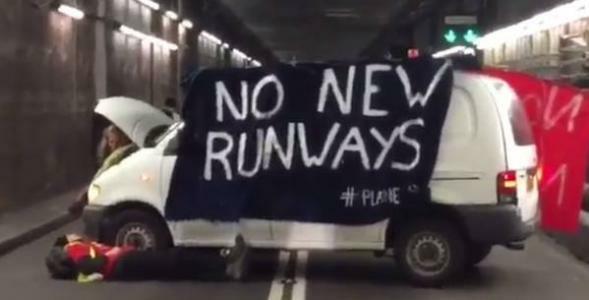 Developing a dialogue with, and demonstrating solidarity with communities impacted by aviation and climate change locally and internationally, has been part of the work of Plane Stupid for some time. Globally, climate change disproportionately affects people of colour. In addition, in the case of City Airport, it is the predominantly non-white and low income community of Newham who will suffer the worst local environmental impacts from airport expansion – including noise and air pollution, leading to health problems such as heart disease, sleep disturbance, asthma, and depression - all of which can lead to early death, and compound existing health problems. By contrast, the people flying from City Airport are predominantly white, and typically have an annual salary of over £90,000. City Airport has recently been granted permission to expand, despite the obvious contribution of this expansion to climate change, and the aggravating impact expansion will have on existing inequalities in the Newham area. Plane Stupid believes in a just and sustainable transition to a peaceful, low carbon future. Plane Stupid is against all airport expansion, and will continue to take direct action in pursuit of this aim. Plane Stupid supports all other actions targeted against aviation where these are not inconsistent with our ethos. Yesterday morning #UKBlackLivesMatter carried out a series of actions across the UK following a call for a #ShutDown. to be heard. Business as usual is a crisis. Therefore, we must #ShutDown. is part of the same way of thinking that is driving racism in the UK. over 70% - are taken by a rich minority of the population – just 15%. these lives to matter that they can make such life destroying decisions. price. This is Climate Colonialism. This is Environmental Racism. direct action is necessary to bring about change. It's time to #ShutDown. From the UK to Atenco, Mexico - NO NEW RUNWAYS! Today (3 May 2016) our comrades in Mexico are remembering their loved ones who were brutally repressed 10 years ago by the Mexico State. That repression took the form of murder, torture and sexual violence. The communities had been resisting displacement and forced removal by the authorities to make way for a new airport. The intimidation and oppression those communities face, mainly indigenous people, is ongoing. We condemn the actions of the Mexico State, and the companies involved in the airport project in Atenco, Mexico. We support the right of the people of Atenco to defend their lands and to resist capitalist oppression. We stand in complete solidarity with the people of Atenco. We particularly condemn the involvement by UK companies in the airport project, including engineering consultancy Arup and architects Foster and Partners. We know that our struggle for ecological and social justice can only be achieved if the people of Atenco win their struggle against the airport and all forms of capitalist oppression. We stand in solidarity with the people of Atenco! Back in November we blocked the main inbound tunnel leading to Heathrow airport. We parked our van across the lanes and locked ourselves to it. We would like to take this opportunity to explain our actions. The building of a third runway at Heathrow has been discussed in Parliament multiple times now. Its purpose would be to meet the demands of the 15% of people who take 70% of flights in the UK. It is leisure flights, not business flights, that are on the rise and the people taking those flights have a high income. 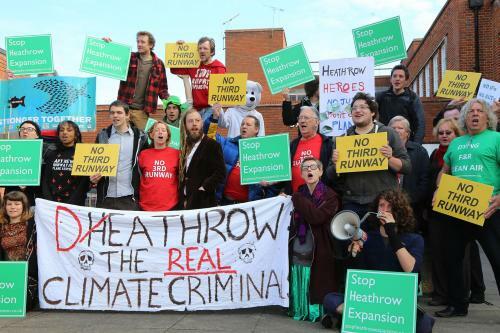 While the huge business entity that is Heathrow spends tens of millions advertising its plans for expansion, the locals whose lives will be entirely uprooted struggle to make their voices heard. This is an issue of class: a familiar story of a rich and powerful elite trampling over the livelihoods of those lacking the power to resist. Further to this, air pollution levels in the UK are on the rise, and pose a huge threat to public health. The day we locked on to our van to block the tunnel, the building of another runway was debated again in Parliament. Our action raised awareness of the threats to the global environment, local communities, and public health posed by a new runway. Every mainstream newspaper outlet that day published a story about the Parliamentary debate, and alongside it were photos of the roadblock and our “No New Runways” banner. Just days after our action, it was announced that the decision had been pushed back. It is scheduled to be debated again in the summer. Acts of resistance are far more effective when they have the support of the public. At 10am on Tuesday 19th april at Uxbridge Magistrates Court we will be on trial, pleading guilty to and being sentenced for a charge of Obstructing the Highway. Meet outside at 9am. It is likely to last around a couple of hours. Please come along to stand in solidarity with all of those battling the violations that airport expansion poses.